Ukrainian Orthodox Church of the USA - The First Week of Great and Holy Lent in Chicago Deanery! The First Week of Great and Holy Lent in Chicago Deanery! 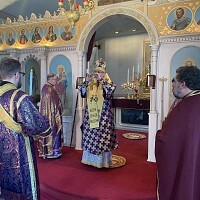 The first week of Great and Holy Lent in Chicago Deanery of the Ukrainian Orthodox Church of the USA concluded in various prayer services served by the ruling hierarch of the Western Eparchy His Grace Bishop Daniel. 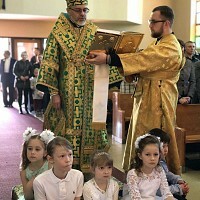 On Cheese-fare Sunday, Vladyka Daniel began the Lenten journey with the faithful of St. Volodymyr Cathedral in Chicago. With the sounds of the cathedral bells, singing of the choir, prayers of the faithful and the message of repentance and fervent prayer, the cathedral community entered into the Great and Holy Lent. His Grace Bishop Daniel addressed the membership of the parish family with the message of repentance. At the conclusion of Divine Liturgy, he blessed the newly-elected parish board of administration members enabling them to begin their service in the Name of God to the people of God – members of the Cathedral parish family. The services concluded with the traditional and prayerful “Rite of Forgiveness” on the eve of Great Lent, initiated when the Bishop asked for forgiveness from the clergy and faithful present for all he has done to hurt, affront or ignore them through the past year and then encouraged all present to ask forgiveness from each other. With the words of humble prayer, and some with tears of love and repentance in their eyes, the parishioners departed home to begin the Lenten journey. On Monday night, Archimandrite Pankratij, the pastor of the Cathedral parish family celebrated with His Grace Bishop Daniel the Canon of St. Andrew of Crete, a service during which all present in great humility make numerous penitential prostrations, praying: “Have mercy on me, O Lord, have mercy on me!” This same service of humility was celebrated the following evening at Sts. Peter and Paul parish in Palos Park, IL with Very Rev. Fr. Taras Naumenko, pastor of the congregation, and his parish family. On Wednesday of this first week of Great Lent, Bishop Daniel served the Liturgy of Presanctified Gifts, again at St. Volodymyr Cathedral, while later in the evening, again praying the Canon of St. Andrew of Crete. On Friday morning, the Liturgy of Presanctified Gifts was served again at St. Volodymyr Cathedral by the pastor, Archimandrite Pankratij. His Grace Bishop Daniel presided over the service, following which the clergy of the Chicago Deanery shared in a spiritual retreat, reflecting upon their ministry and the Lenten journey of the Church of Christ. On Saturday morning, His Grace Bishop Daniel arrived at Holy Trinity Ukrainian Orthodox Church in Bensenville, IL to serve with the Deanery clergy and the faithful in the celebration of the Divine Liturgy. The bishop preached a sermon reflecting upon the meaning of this first Saturday of Great Lent and the first Sunday of Great Lent - the “Sunday of the Triumph of Orthodoxy” in commemoration of the return of the prayerful use of iconography in Orthodoxy. Following the Divine Liturgy, the parish sisterhood treated everyone in presence with the Lenten lunch. The annual Chicago Deanery meeting also took place this day. Very Rev. Bohdan Kalynyuk, the Dean of the Chicago Deanery welcomed his brother clergy to his parish and offered his sincere gratitude for the support and work of the Deanery clergy in their parish congregations. 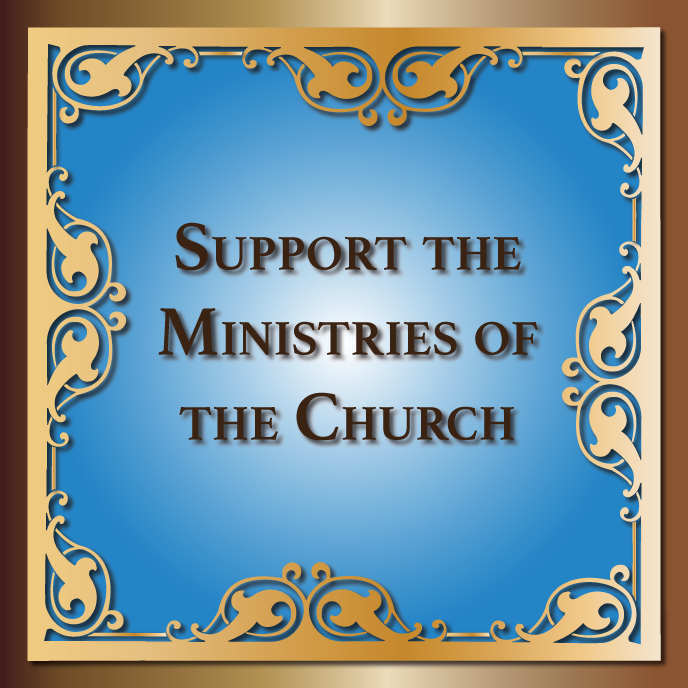 At the invitation of His Grace Bishop Daniel, Protopresbyter Frank Estocin, Pastor of St. Volodymyr Cathedral, Philadelphia, PA, shared with the clergy present his reflections upon the pastoral ministry in the 21st century. During the meeting, a number of creative ideas were discussed and plans were made for 2010-2011 Deanery projects and programs. His Grace Bishop Daniel again visited Sts. Peter and Paul parish in Palos Park, IL for the Sunday of the Triumph of Orthodoxy. In his sermon, the bishop reminded the faithful of the meaning of the day in celebration of our iconography as an integral part of our Orthodox worship, but also added that: “…on this the first Sunday of Lent, we need to remind ourselves that we all are icons -- the living reflections of God -- that need to be restored. We need to rise and return to our Father, because one day we shall stand before the Judgment Seat of our Lord to give an account of all we have done. Only Jesus can cleanse the soiled image of God in us -- the tarnished icon -- and restore it to brilliance. We are the icons that are damaged and have been buried over with layers of sin and we need to be cleansed so that we will reflect the beauty of Christ. We need to recapture the meaning of what it means to be in the image of – to reflect – God to the world. We need to actualize the image of God in us.” The Liturgy concluded with a procession with icons, carried by the children of the parish family during the service of the Triumph of Orthodoxy. Fr. Taras Naumenko and the parish board of administration, invited everyone in attendance to participate in a Lenten luncheon. In the evening of this day, Bishop Daniel, accompanied by Fathers Kalynyuk, Archimandrite Pankratij, Naumenko and Subdeacon John Charest participated in the all-Orthodox Sunday of Orthodoxy Vespers along with other Orthodox hierarchs, clergy and faithful at Holy Resurrection Serbian Orthodox Cathedral, sponsored by the Chicago area Orthodox Clergy Association. Pan-Orthodox Celebration of the Sunday of Orthodoxy in Chicago, IL! Pani Dobrodiyka Iryna Ilchuk of Blessed Memory!